Since the beginning of civilization, smart business people have fed a need based on economic trends. For example, the California gold rush where people were hungry for the gold in those hills. There was a lot of money involved and if you could offer a service that increased the chances of striking it big, you’d be successful. The smart, innovators of the world through each generation see the potential. Instead of gambling with the glory of finding a big vein of gold, you could have consistent incoming money without risking your life. This can be seen today also. Instead of trying to compete in one of the big trends, some companies will aid in the trend. When a big technology trend arises from online videos or social media, entrepreneurs will try to leverage their product or service on the trend. This is far more lucrative than trying to compete with the pioneer of the original idea. The consumer product is the gold mine while the tool to make those consumer products more enhanced are selling the pickaxes. Here are some examples of companies that intelligently gained success while riding on a big economic trend. In terms of the gold rush, it wasn’t about the gold at all. It was the fact that it was a source of wealth normal people could take advantage of with their innovation. In the start-up world, they still use the term, “you can mine for gold or you can sell pickaxes”. This comes from the California Gold Rush. Success came not from those who struck gold but from innovative suppliers. Selling tents, jeans, pickaxes, and wheelbarrows to make a miner’s life easier or help them gain better access to gold was a highly lucrative endeavor. 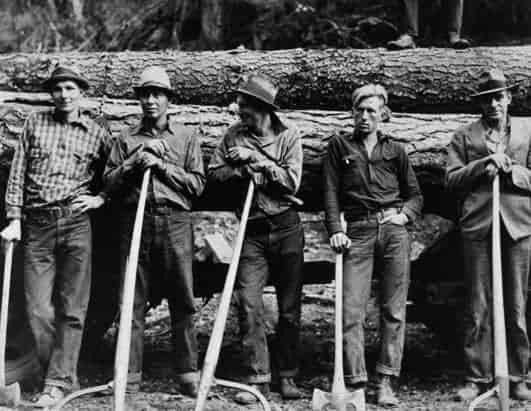 In 1948, the first “gold rush” outside of Sacramento brought thousands of people from all over the world. With the hopes of making their fortune in gold mining, the population grew from a couple of hundred people to 75,000 people. This also brought smart entrepreneurs seeing a different opportunity. Levi Strauss was one of the thousands who moved to the boom town in San Francisco. His business plan was to make money on dry goods, sewing materials, and ready-made clothes. While the glory sat with finding gold, the rush itself had a lot to do with the many people it brings to the scene. There were brothels, bars, and banks that all capitalized on the gold rush. The companies that really struck it rich due to consistent sales were the suppliers. Levi Strauss, of course, supplied his work jeans. Miners liked them because of the reinforced pockets with Levi’s now signature rivets. Sam Brannan did well for himself also, selling picks and shovels and staking gold miners. Levi Strauss stuck with his “work pants” and is still a beacon of smart business practices. Brannan became California’s first millionaire. He upgraded shovel selling to buying real estate and banking.